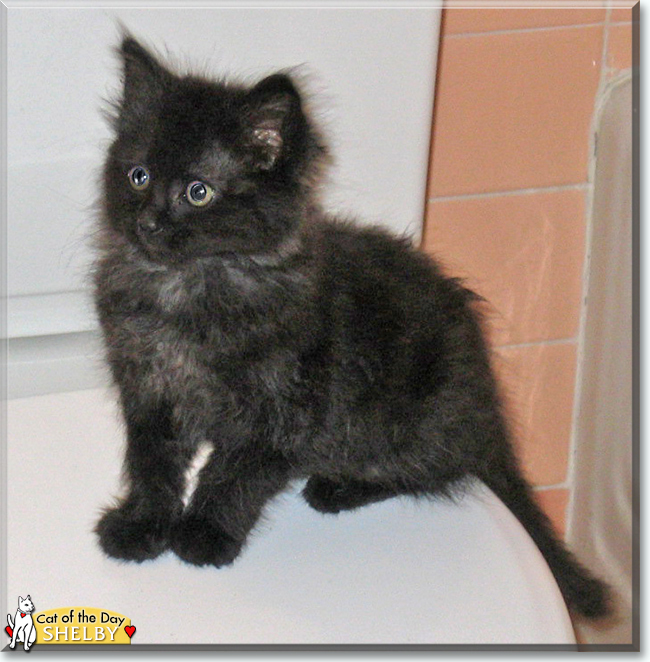 Hi, my name is Shelby and I'm a three-month-old long-haired black and silver tabby mix. My sister and I were abandoned in the weeds and rescued by a very kind man who found homes for us. He thought I was a girl -- oops -- and nobody knew the truth for a month. My human mommy fed me with a baby bottle, since I was only four weeks old and didn't know how to eat solid food yet. Now I eat everything in sight, including the food that belongs to the two other cats that live with me. Their names are Christine and Hemi, and they're much older than I am. Christine gets mad at me sometimes, but Hemi is my best friend. We hang out in the yard, and cuddle up next to each other at night. I climb on everything and love to shred toilet paper and napkins, but my favorite thing is cuddling up with my parents when they watch T.V. at night. I am practicing to set a world record for the "loudest purr," and I promise not to eat the hamster! Talk about Shelby in Pet Talk!